EVERY little boy has a spy fantasy that involves high-level espionage, fast cars and sharp bespoke suits. The James Bond influence has long inspired classic bespoke tailoring and opened the door for a host of Secret Service movies to impact on our imaginations. The most recent, Kingsman: The Secret Service, sees a suave and sophisticated Colin Firth (looking as dapper as usual), play Harry Hart (code name: Galahad) who says “the suit is the modern gentleman’s armour”. We couldn’t agree more. Spies, and their counterparts, the villains/criminals, are undoubtedly some of the best-dressed men in the movies. They effortlessly know how to wear a classic three-piece bespoke suit whilst brandishing a lethal weapon (which may or may not be housed inside an umbrella, another quintessential gentleman’s accessory), and dangling a damsel in distress on one arm. Stylish spies ooze sophistication, elegance and power. With headquarters cleverly disguised within a Savile Row tailor’s shop, the elite private team of spies battle to save the world, displaying death defying stunts, sky diving antics and striking bespoke attire along the way. The extensive bespoke wardrobe worn throughout Kingsman: The Secret Service is central to the movie’s appeal. The classic suit collection features distinctively English tailoring and styling, and brings back the double-breasted suit, a style that Henry Herbert has also championed recently (with the Campaign to Bring Back the Double Breasted). Worn as modern day armour by cinematic spies and secret agents, the bespoke suit has become the acceptable uniform that can also be worn in real life. Bespoke tailoring should make you look good and feel great. Taron Egerton plays Gary “Eggsy” Unwin, a seemingly unrefined petty criminal who is recruited by Firth and painstakingly taught everything he needs to know about acceptable table manners and occasion-appropriate footwear. The elite team may look like high-end accountants but don’t be fooled because they can handle any high-octane fight without breaking a sweat or ripping a seam. Tinkler, Tailor, Soldier, Spy is a British espionage thriller starring Gary Oldman as George Smiley, the spy who is brought out of retirement to track down a double agent. The bespoke tailoring is civil service chic and reflective of the ‘70s. Colin Firth (yes, him again), Benedict Cumberbatch and Tom Hardy also star. The Ipcress File stars Michael Caine’s skint MI5 agent Harry Palmer. The iconic wardrobe features classic ‘60’s bespoke style and distinctive thick-rimmed glasses. Bond. Any and all films. So iconic is the character’s sartorial elegance and style that any actor playing the part appears believable. Bond is always impeccably dressed and ready for action or any occasion – casual or formal. This super spy wears black tie like no one else, and we applaud his ability to stay immaculate in any situation. Besides the gadgets and cars, all you need is a handmade suit that flatters your physique, enhances your appearance and creates the allure of mystery. 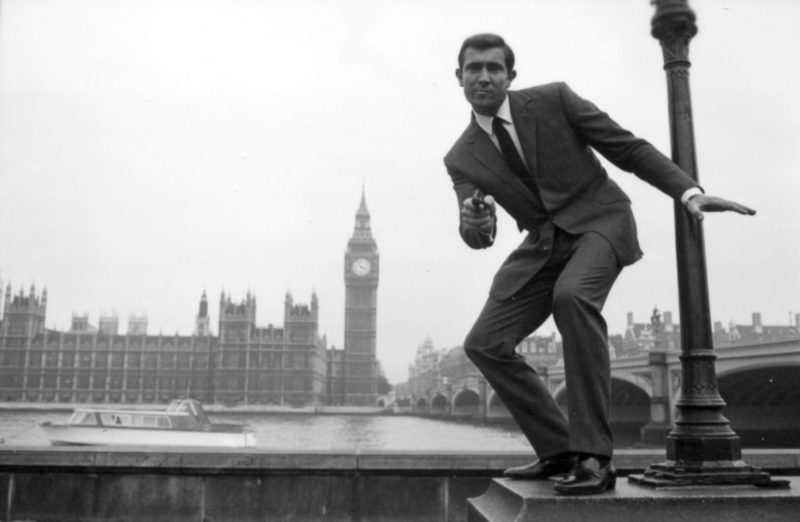 So who wants to play James Bond in real life? See also: Bespoke Suits, bespoke suits london, James Bond, Kingsman, Soldier, spy suits, Suits & Spies, tailor, Taron Egerton, Tinkler, what did James Bond wear. New York Bespoke Tailor: New York, New Suits! Suits & Spies - Bespoke Suits By Savile Row Tailors.